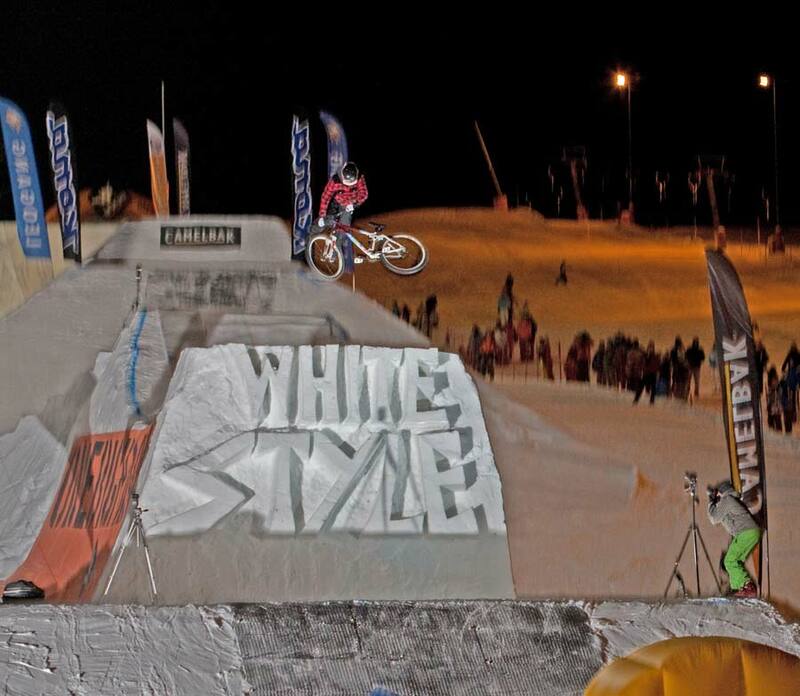 Europe’s young guns dominated the fifth anniversary of the “White Style presented by Kona” winter slopestyle competition in Leogang last Friday evening. Riders from North America made into the top ten: Darren Berrecloth became fifth, Cam McCaul sixth and Jamie Goldman seventh. Great Britain’s other well-known faces, Sam Reynolds and Grant Fielder, placed eighth and ninth. A highlight clip featuring the best of the action and the three winning runs will be available on www.watch26.tv very soon. More than 2,000 spectators made their way to the White Style course designed and built by Kona Clump team rider Grant “Chopper” Fielder. 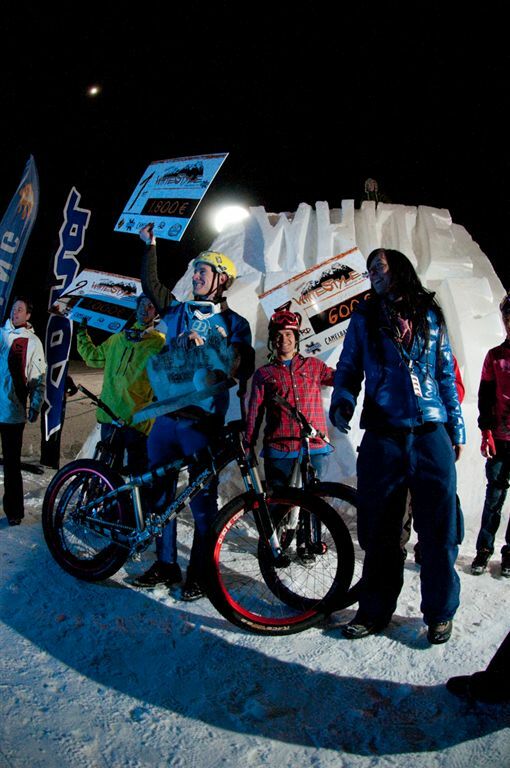 Grant received lots of props from the other riders for the set up consisting of different elements like: An igloo at the start with a small drop, a set of two doubles, followed by two massive fruit bowls combinations (with a 15ft. drop) as well as a huge double at the finish (about 40ft. far). Riders jumped the last gap and reached up to 25ft. above the ground. The most important point to remember: the whole course was built out of snow. So it was definitely a challenging set up. 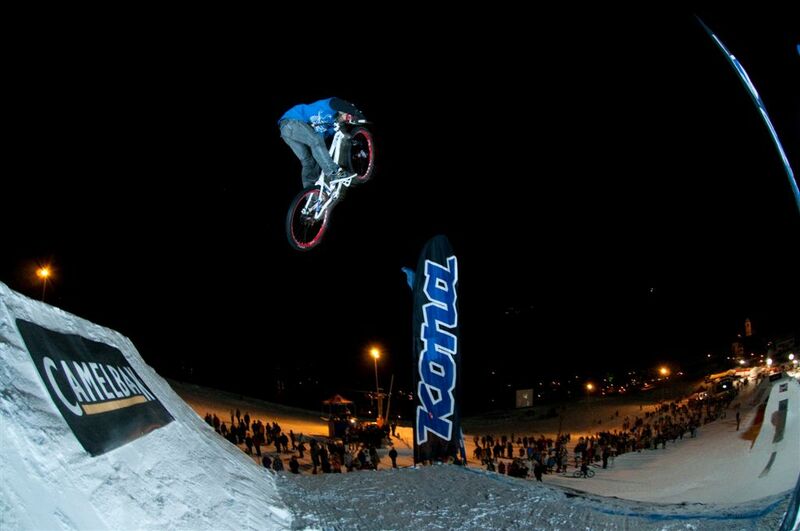 But some of the world’s best riders came to Leogang. They impressed the spectators and sometimes each other by pulling off the biggest tricks that were seen in a mountain bike contest. The riders seemed to feel already quite comfortable in the first training session on Thursday, and even more on Friday. Some of them even changed from their small travel full suspension bikes to hardtails – a proof for a smooth course, even though there was so much airtime involved. The qualifications on Friday evening were dominated by Swedish rider Martin Soederstroem (technical and clean riding including double tailwhips), Yannick Granieri from France (by far the biggest backflips performed on a contest), U.S. American Cam McCaul (great style and big bag of tricks), Canadian Darren “The Claw” Berrecloth (360 look downs at its best). Linus Sjoeholm (SWE), Amir Kabbani (GER), Sam Pilgrim (GBR) and Jamie Goldman (USA) completed the Top 8 of the qualifyings. But qualifications and finals are always a different kettle of fish. 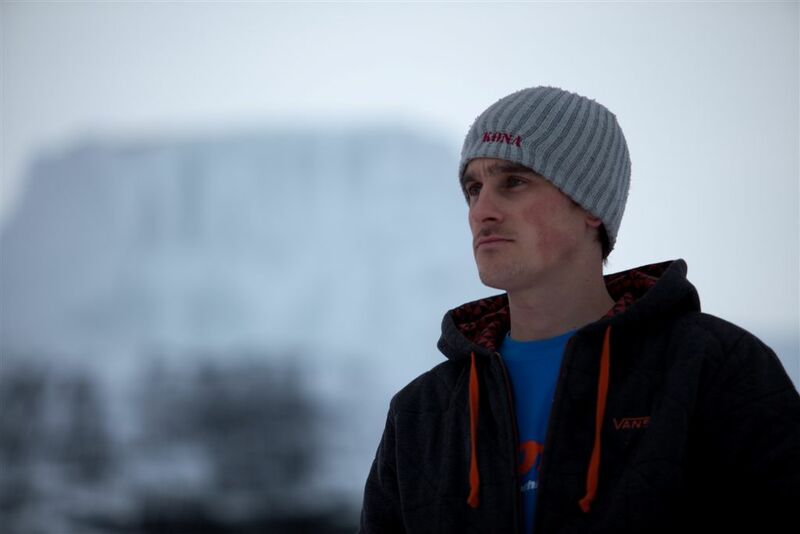 Martin Soederstroem, who won the qualifications, couldn’t finish his first run because of a technical issue. Then he crashed pretty hard on his second final run trying to pull a double tailwhip because he overshot the 40ft. gap and landed to far down – 11th place for him. Jamie Goldman did what he can do best, showing a huge backflip off the big fruit bowl, but unfortunately slipped from his pedals landing a backflip superman at the last double and therefore only placed 7th. Cam McCaul, Darren Berrecloth and Amir Kabbani showed clean runs including backflip tailwhips, super seaters, opposite 360s, 360 x-ups and backflips. But it was France, Sweden and Great Britain to dominate the podium. 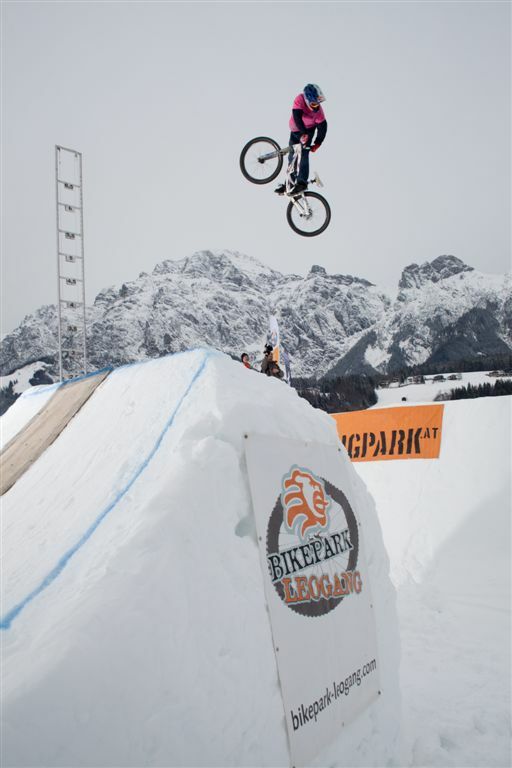 Yannick Granieri managed to be the highest one in Leogang’s sky with huge 360s, backflips and tailwhips in his first run. 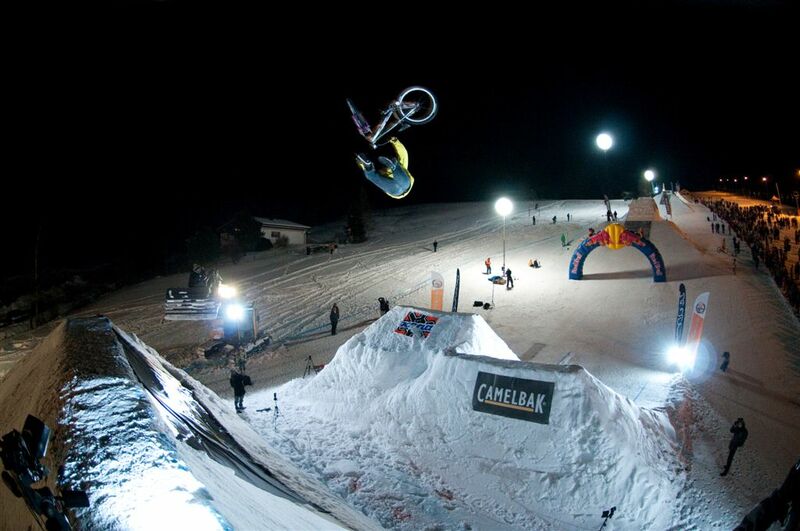 He might have even been at the top of the podium, if he had landed his 360 tailwhip drop in his second run. But he over rotated and missed the following jumps. The third place is still a good result for him and a good start into 2010 on his new bike. 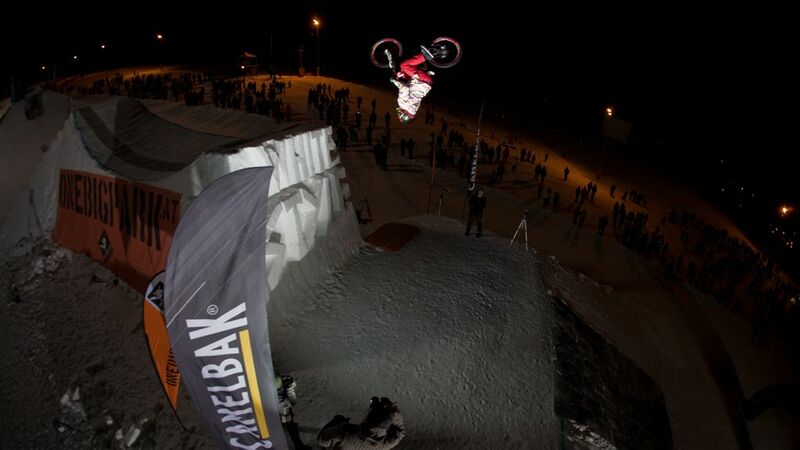 Linus Sjoeholm, Martin Soederstroem’s best riding buddy, was the big surprise of the contest. 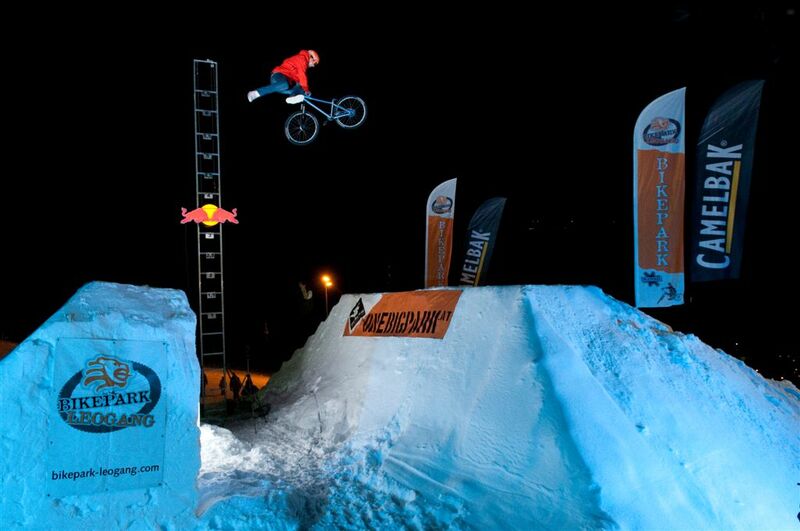 His clean execution and range of technical tricks impressed the judges and spectators: 360 at the starting drop, double tailwhip at the first double, superman at the second jump, backflip off the fruit bowl, barspin into the 2nd fruit bowl, tailwhipping the big drop and finishing his run with a flipwhip at the last double. Linus’ second place and 1,000 Euros were well deserved! For all of you that didn’t make it to Leogang last weekend: A 24 minute event report will be aired soon in the Red Bull TV window on Servus TV: March 6th at 11:30 pm CET. You can watch it with your digital satellite receiver or on March 6th at 11:30 pm CET also live online at www.servustv.com (click “Servus TV Live” link on the bottom left hand corner for the stream).